A pretty average week for Week 10. 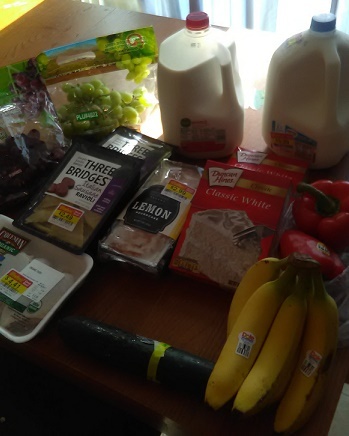 My first shopping trip was QFC on Monday. I found myself in Bellevue with an hour to kill so I stopped at the closest grocery store for tortilla chips, cereal, and any other bargains I could find. I scored with clearance Tony Roma's pulled pork for $2.99 in the one pound package. 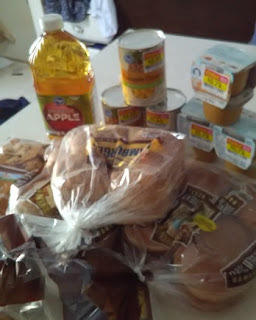 I bought 5 packages and was able to use them for our potluck dinner Friday night. I added 2 cans of shredded chicken that were in my pantry to add bulk (thanks to my friend & mom of 7, Stephanie, who suggested it!). I also found some clearance baby snacks for $0.29/ea, clearance hummus for $2.29, and I picked up 3 organic zucchini and an organic cucumber. Cereal was on sale for $2.00 and I got a free half-gallon of organic milk for buying 4 boxes. I had a $1.00/3 MC, too, for the cereal. A sweet friend also gave me some gf tortillas & gf pizza crust Monday so I added them to the picture. I spent $32.66 on food at QFC. Next was a Friday trip to Fred Meyer for hamburger buns I needed for the pulled pork potluck that night and brown sugar that the kids kept begging for since their morning oatmeal wasn't the same with honey or white sugar. DD2 asked me to buy apple juice for her sleepover that night. I also found baby food on clearance for $0.79/2-pack and chunk pineapple for $0.69/can. I spent $12.68. I was also at QFC Friday with DD2 after our weekly Bible study. I bought organic 1% milk on clearance for $3.29 and a regular price ($5.99) organic whole milk. I found 2 cake mixes on clearance for $0.79 each, clean ravioli on clearance for $2.49 each, organic chicken thighs on clearance for $3.37/lb, a clearance lemon pound cake for $2.99 for a playdate, and some nice candy on clearance, too. I'm saving that candy for gifts so I'm not including it in the grocery budget. I bought organic bell peppers for $1.00 each, bananas, an organic cucumber, and regular grapes for $1.78/lb. I spent $33.54 on groceries. 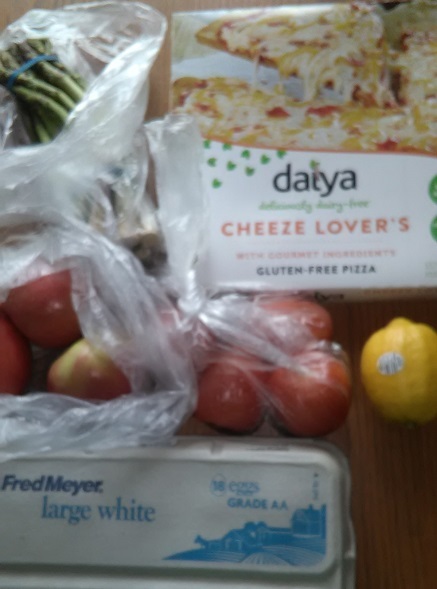 Saturday I was back at Fred Meyer for eggs and a lemon so I could make food for a brunch in Sunday school the next day. I also bought a gf/df pizza because DH and I were going out that night and pizza would be an easy dinner for the sitter. I bought asparagus, roma tomatoes, and organic apples. I spent $16.52 on food. p.s. I know I haven't been buying much fruit. My kids are still plowing through several quarts of canned applesauce and 1 to 2 quarts of canned peaches each week.